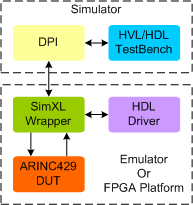 ARINC 429 Synthesizable VIP provides an smart way to verify the ARINC 429 component of a SOC or a ASIC in Emulator or FPGA platform. ARINC 429 Synthesizable Verification IP implements the air transport industry’s standards for the transfer of digital data between avionics systems. ARINC 429 Synthesizable VIP provides an smart way to verify the ARINC 429 standard data transmission and control interfaces between source and sink. The SmartDV's ARINC 429 Synthesizable VIP is fully compliant with ARINC SPECIFICATION 429 PART 1-17 and provides the following features.